Bradley booed by the crowd. Las Vegas, Nevada - Reigning WBO welterweight champion, Timothy Bradley Jr. and challenger Manny Pacquiao are looking to knock each other out in tomorrow's championship contest and rematch at the MGM Grand Garden Arena. But before they do that, they knocked the weight limit requirements and medical clearances needed for their main-event fight which will be broadcasted worldwide by various networks around the globe. Pacquiao, (55-5-2, 38 KOs) stepped in the scales first and weighed in at 145 lbs. followed by the undefeated Bradley, (31-0, 12 KOs) who clocked in at 145.5 lbs. The official weigh-in, an integral part of Fight Week activities, was held at the venue of tomorrow's fight and was attended by about 4000 fans - a giant slice of it came here to support Pacquiao. Amidst boos and chants of "Manny, Manny" , Bradley Jr. egged the crowd to continue their heckling as he flexed his muscles at the stage. He was asked what different strategy is he bringing to the fight tomorrow. 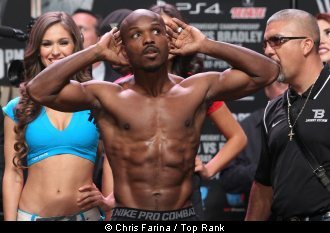 "I will have to knock Pacquiao out," a confident Bradley quipped. Pacquiao was all smiles as he waved to the enthusiastic crowd who trooped to the Fight Capital of the world in Pacquiao's first fight in Sin City for more than a year. The Filipino slugger is also looking for a knockout win of his own, one that has been missing in his performances of late. A knockout over Bradley will put a period in the debatable result of their first fight in 2012. "This time around, I have to finish the business first. There is a business in the ring that I have to do and I will do what I can do," Pacquiao said. All of the undercard fighters also made weight in the official scales which was manned by the Nevada State Athletic Association and the different boxing organizations who have a jurisdiction over their fights. Here is the complete list of today's weigh - in from the MGM Grand. Arash Usmanee (20-1-1, 10 KOs) :135 lbs. vs. Ray Beltran ( 28-6-1, 17 KOs) : 134.5 lbs. Jessie Vargas (23-0, 9 KOs) : 140 lbs. vs. Khabib Allakhverdiev (19-0, 9 KOs) : 139.5 lbs. Jose Felix (26-0, 21 KOs) : 130 lbs. vs. Bryan Vazquez (33-1, 17 KOs) : 130 lbs. Adrian Perez (10-4-1, 1 KOs) : 130 lbs. vs. Oscar Valdez: (9-0, 8 KOs). Joe McCreedy (15-6-2, 6 KOs) : 173 lbs. vs. Sean Monaghan (20-0, 13 KOs) : 175 lbs. Pubilo Pena (2-1, 1 KOs) : 162 lbs. vs. Esquiva Falcao (1-0, 1 KO) : 161 lbs. Mike Montoya: (4-2-1, 2 KOs) : 173 lbs. vs. Oleksandr Gvozdyk (Pro Debut) : 174. 5 lbs.